An interesting solution to the location of the pushers on the new Santos chronograph ensures that nothing detracts from the stylish lines of the case. 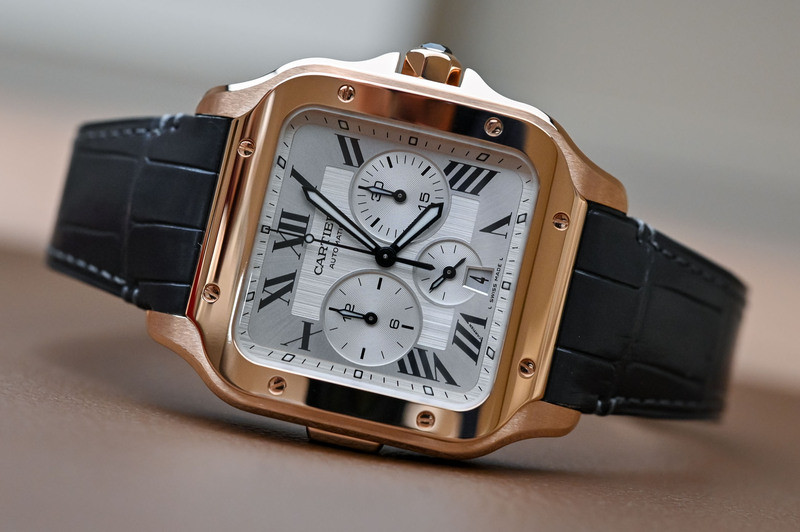 Having given the Santos new wings in 2018, Cartier expands the bestselling men’s collection in 2019 with the addition of a chronograph. 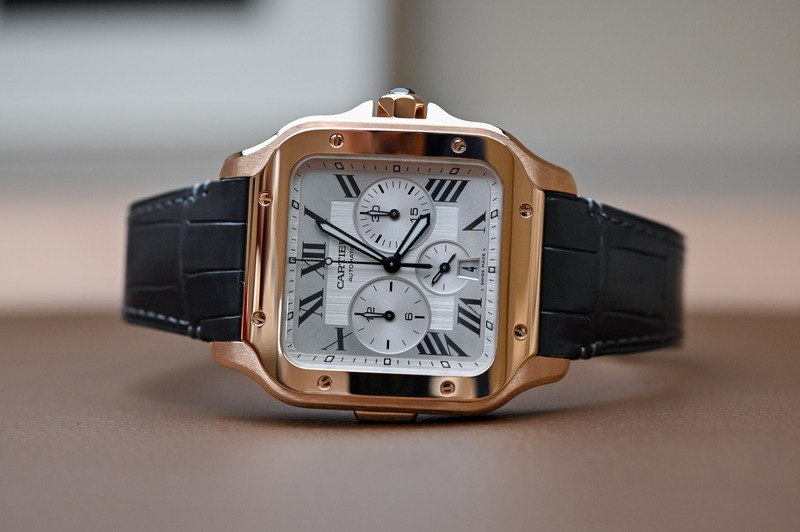 Thicker, wider and infinitely sportier, the new Santos de Cartier Chronograph has found an elegant solution to replace the classic two-pusher chronograph configuration with a modified version of its automatic 1904-CH MC calibre. Presented in three versions – solid 18k pink gold, steel and yellow gold bezel, and steel with a black ADLC bezel – we have selected the stylish pink gold model for our hands-on review. When Brazilian aviator Santos-Dumont commissioned a watch from his friend Louis Cartier in 1904 that he could wear while piloting his plane – and not have to lift his hand from the controls – little did either of these gentlemen suspect that the result would become one of the most popular and enduring Cartier icons of all time. Characterised by a square case with visible screws, a shape that flew in the face of the fashion for round pocket watches, the Santos has gone down in history as the first pilot watch and a precursor of the gent’s wristwatch. What started off as a bespoke commission went into serial production in 1911, with LeCoultre movements, and took off in the 1970s when it was revisited in a bracelet piece with screws on the bezel and bracelet. Taken out of production in 2016, the Santos reappeared in 2018 with a refreshed and more curvaceous case, but always respectful of its ancestor’s salient traits. What comes first – the case or the movement? 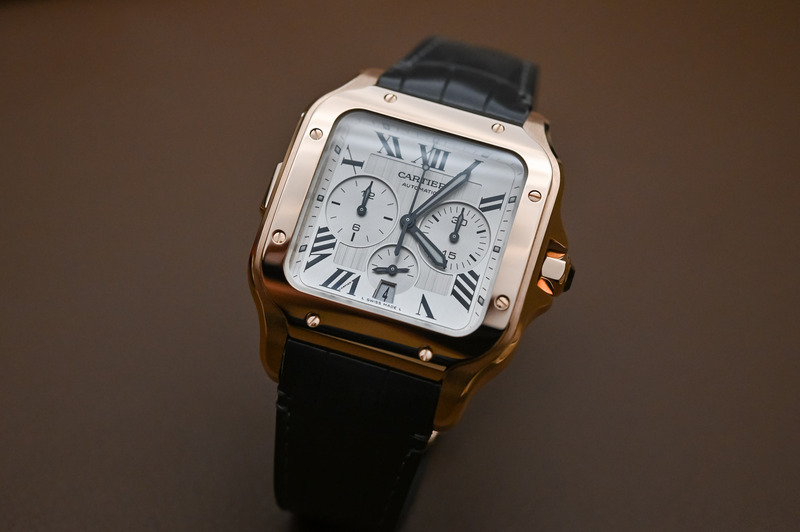 In the case of the Santos de Cartier Chronograph, the overriding concern of the designers has been to respect the sleek contours and symmetry of the iconic case, meaning that the movement, based on the famous 2012 Calibre de Cartier Chronograph, has been modified to relocate the pushers. 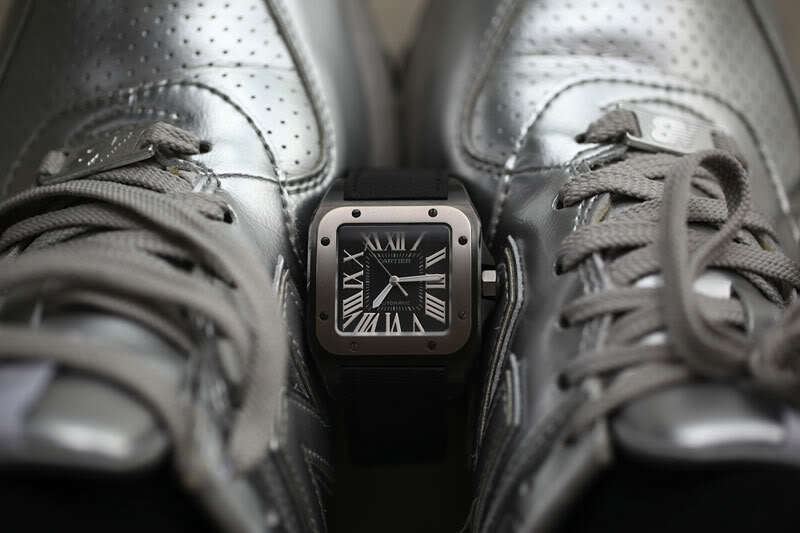 Instead of featuring the standard pair of chronograph pushers on the right side of the case, the Santos Chronograph features a discreet rectangular pusher on the left side of the case for the start/stop functions. Easily mistaken as a monopusher chronograph, the Santos is, in fact, a two-pusher chronograph with the reset function nestled inside the crown and activated by depressing the cabochon. 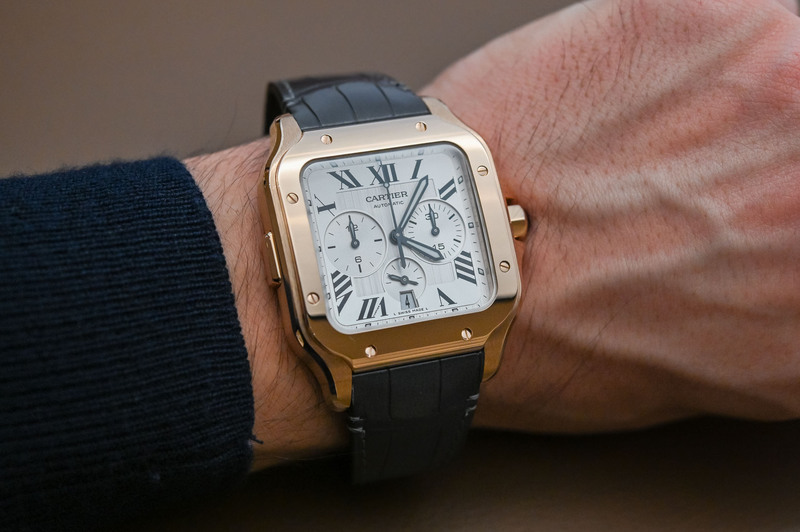 The first impression has to do with the size of the Santos de Cartier Chronograph, currently the biggest brother in the line-up of Santos watches. Touted as an ‘Extra Large’, the case measures 43.3mm x 51.4mm with a thickness of 12.5mm, but the gently curved lugs and integrated bracelet/strap attenuate its corpulence. The revisited case shape of 2018, with its softly rounded edges, sleek satin-brushed case and polished bezel and screws, conveys an immediate sense of luxury and you can feel the reassuring weight of the pink gold. 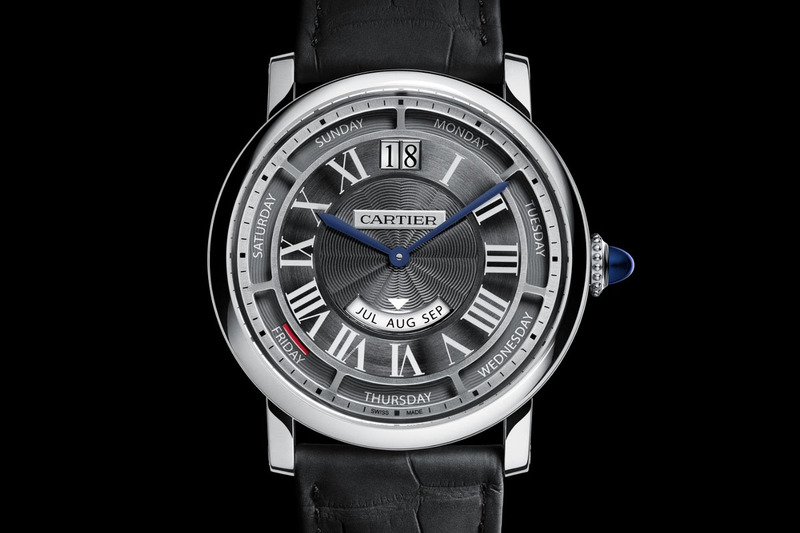 Cartier has a unique ability to create interesting case shapes (see here for the latest revamping of the 1906 Tonneau watch), and even a ‘square’ watch like the Santos comes alive with movement and contrasting surfaces. 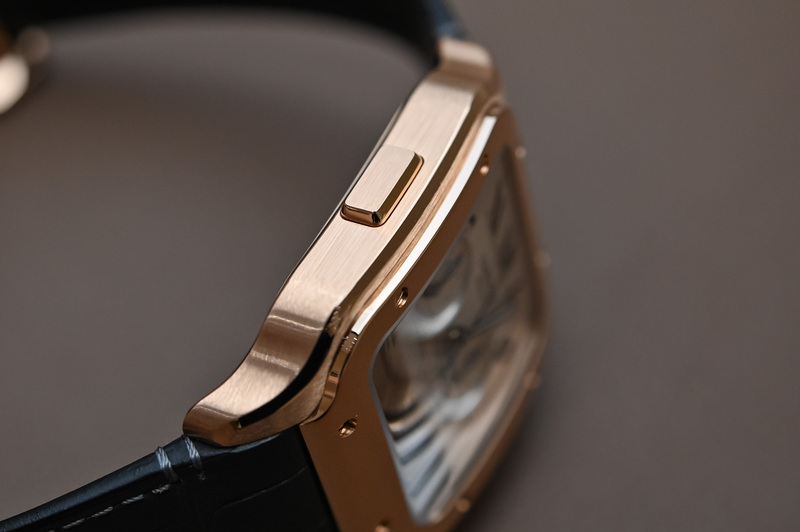 I love the subtle wave shape on the right side of the case and the aperture it creates to embrace the crown and was impressed by the overall fluidity and sophisticated ergonomics of the case. Another big plus is the 100m water-resistance of the case. 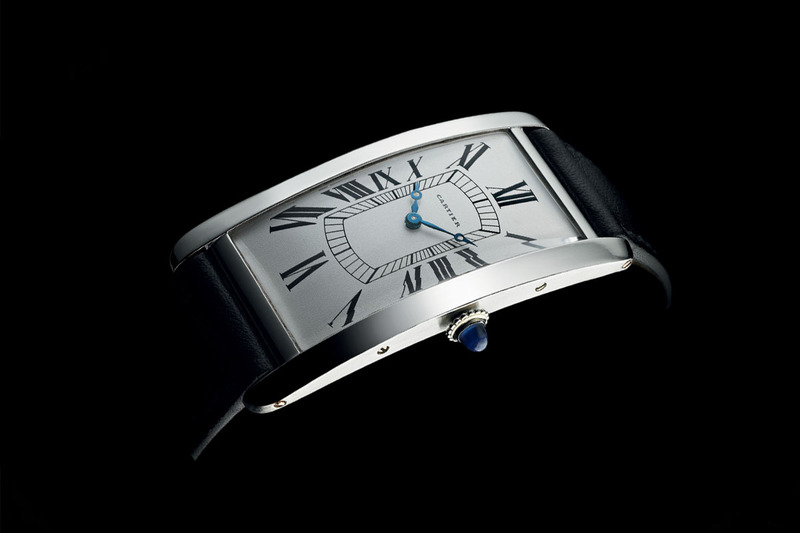 Immediately recognisable as a Cartier timepiece, the dial conveys all the elapsed time information in impeccable style. The square region of the dial has a brushed silver texture contrasting to the snailed and slightly recessed backgrounds of the 30-second and 12-hour registers, and the smaller subsidiary seconds and date function at 6 o’clock. Cartier has made a very good choice regarding the hands exchanging the traditional blued-steel hands for thicker, sword-shaped hands coated with plenty of lume. The hallmark minute scale has also been shifted to the periphery and the Roman numerals are bolder in keeping with the sporty personality of the watch. For many, the incorporation of calibre 1904-CH MC was the really exciting news about this watch and it is a shame that the caseback is closed. 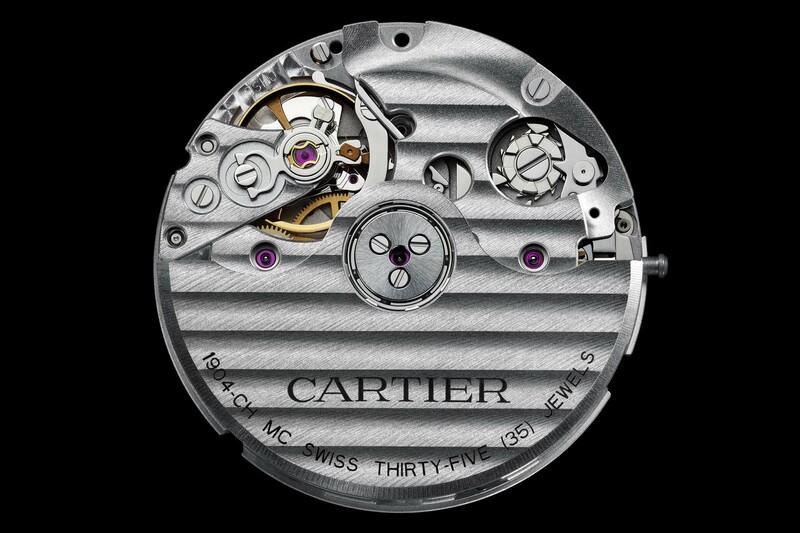 The same base movement as found in the 2012 Calibre de Cartier Chronograph and the Cartier Tank MC, (automatic column-wheel chronograph with small seconds and date is a manufacture movement produced by ValFleurier) for the Santos de Cartier chronograph the movement has been modified to separate the chronograph pushers and place them on separate sides of the case. 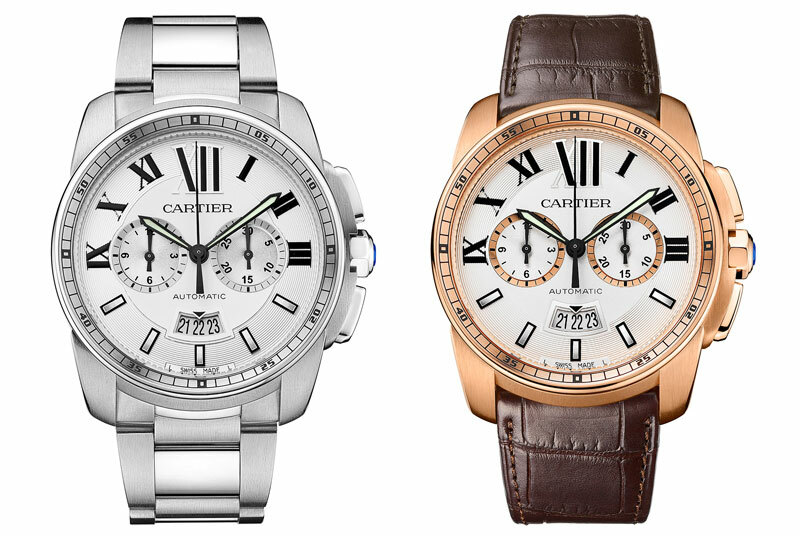 The Cartier Calibre 1904-CH, as used in the Calibre de Cartier or Tank Chronograph. One of the advantages of this movement, that was created under the supervision of Carole Forestier, director of movement creation at Cartier, is the hammer mechanism to ensure the chronograph is reset with the just the right amount of force, no matter how hard or soft you push. With a frequency of 28,800vph/4Hz, the watch has a power reserve of 48 hours. 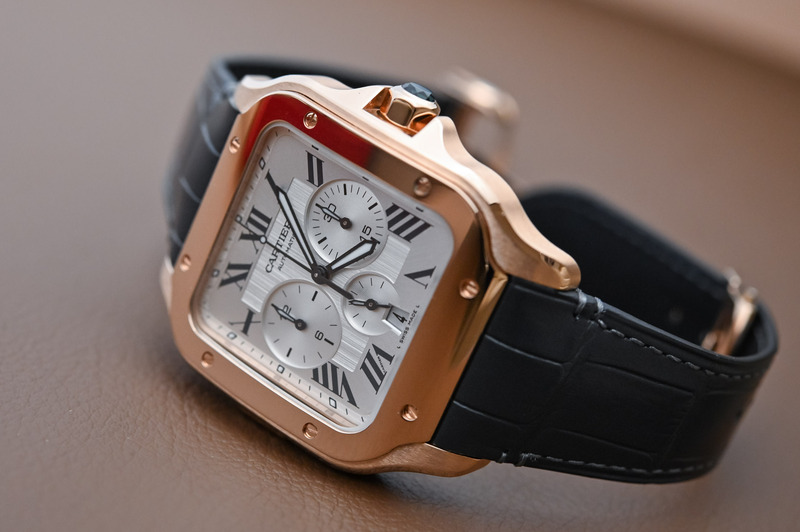 The rose gold version of the Santos de Cartier chronograph come with an alligator leather strap and an interesting textured rubber strap with screws at either extremity of the first links to echo the screws on the bezel. The steel models also come with an integrated metal bracelet. All models are equipped with the brand’s QuickSwitch system – a quick release button that makes changing the strap a cinch – and the bracelets come with the SmartLinks option that lets you adjust the length of the bracelet without the need of a screwdriver. 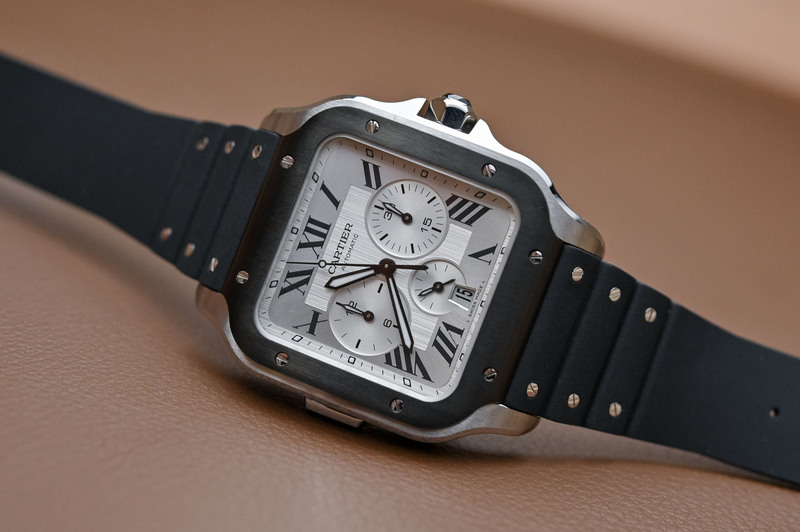 I think Cartier has been extremely successful at conjugating the Santos to create a sporty chronograph without sacrificing an inch of its elegance. Smaller wrists might be overwhelmed by the case size, but the finishes are really first-class and the creative mix of geometry and soft contours sit beautifully on a larger wrist. The selection of wider hands, the generous use of lume and the reassuring water-resistance are vital features for a sports watch that still manages to look dressy and très, très Cartier. 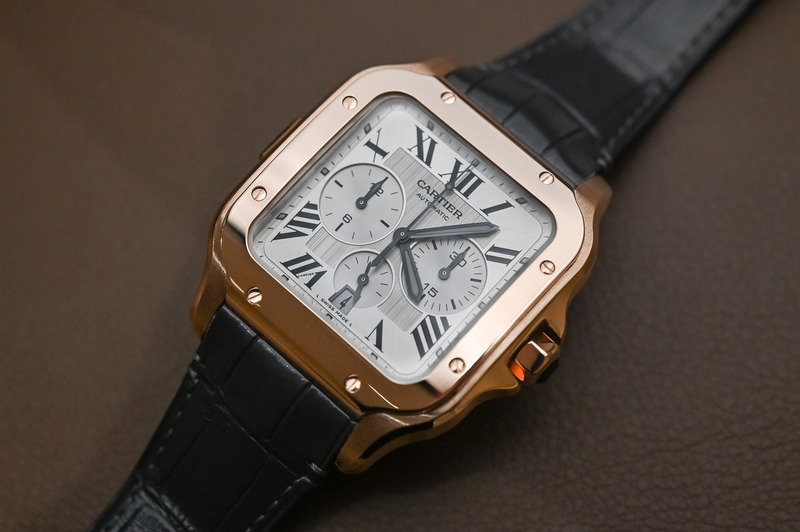 The 18k rose gold model we have featured in this article will be available in April 2019 and retails for USD 24,700. 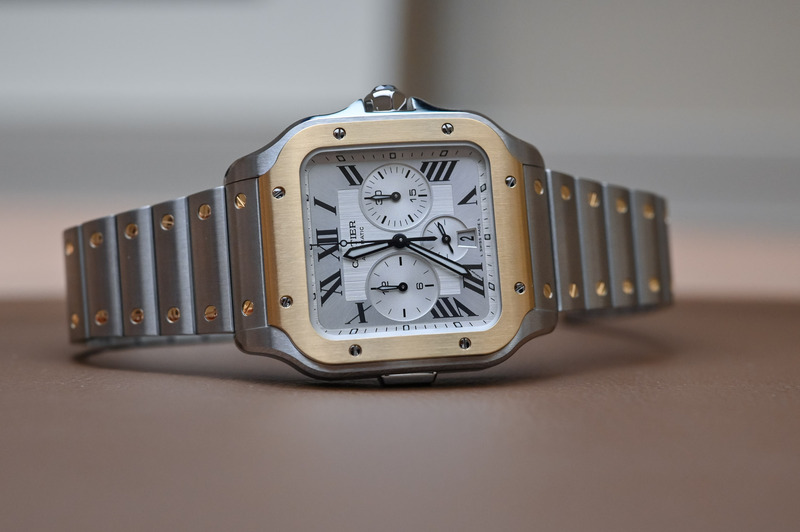 For more information, please consult www.cartier.com. 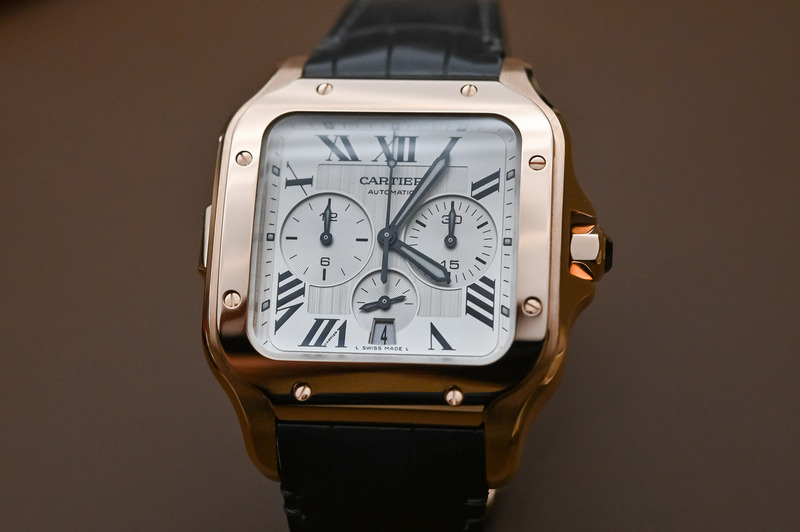 The Santos de Cartier Chronograph is also available in steel with Black ADLC-coated bezel and black rubber strap, as well as in steel with yellow gold accents (bezel and screws on the links) with prices starting at USD 8,950. Both are photographed below.